Classic Mediterranean comfort food and a generosity of spirit permeate this cozy Pacific Grove landmark. 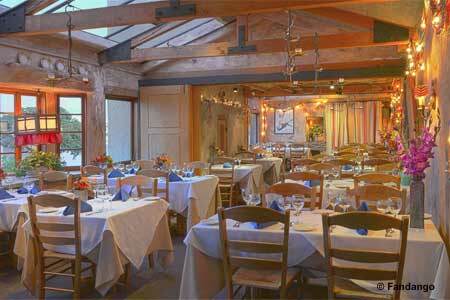 : Enjoy Pierre and Marietta Bain’s hospitality at this Pacific Grove go-to that’s been in operation since 1983. After a warm welcome, dive into the heartwarming comfort food. For a light lunch, order the tangy chicken and lemon soup when it's available. The spinach mimosa salad with grated hard-boiled eggs and bacon is almost a meal in itself. The croque monsieur elevates ham and cheese into a gourmet soufflé. Paella Fandango is redolent with saffron and features sweet sea scallops and Spanish chorizo along with calamari, shrimp and plump mussels. And this may be one of the last bastions of liver and onions done right. Save room for a sweet finish and order the profiteroles: scoops of coffee ice cream in crunchy little puff pastries paired with warm, dark chocolate sauce and whipped cream. Fandango is worth making up something to celebrate.